I finally figured out how to mix with Fernet. Fernet Branca is an Italian amaro, or bitter spirit, dating back to the mid-1800s. Its vibrant blend of 27 various herbs, roots and plants lends it to often be enjoyed as a "digestif," or a drink enjoyed following a meal to ease digestion. Through some experimentation, I discovered that this was a tricky one to mix with for mass appeal due to its boldness of flavor. I found Fernet Branca to start on the fresher side, hinting at mint or eucalyptus, and to finish dry and bitter. 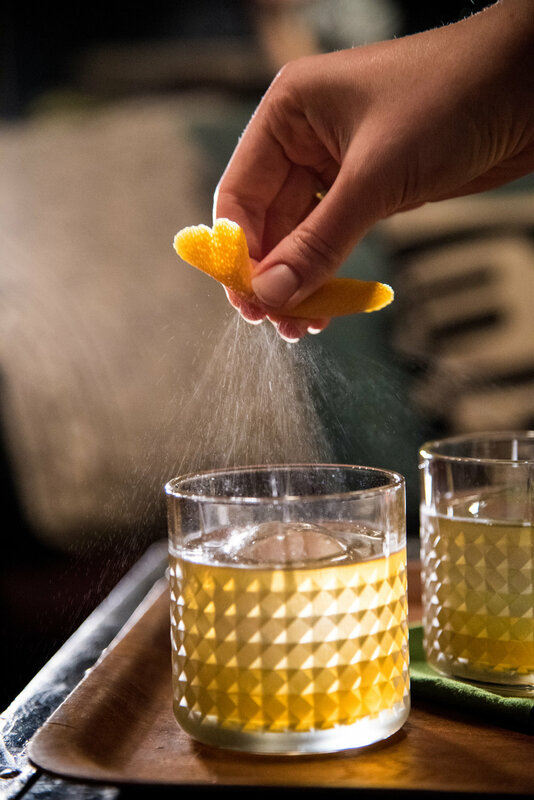 Both the freshness and bitterness can easily overwhelm a drink if not used sparingly or with the right complements. I decided to try balancing the Fernet with fruit and tartness to mellow the bitterness while harnessing the herbal brightness. Conveniently, I had recently received two perfect spirits for the task - Malfy Italian Lemon Gin and Fabrizia Spirits Limoncello. Malfy Gin is an excellent first step for gin non-believers. It hits with lemon rather than juniper on both the nose and the palette and is surprisingly smooth even when enjoyed on the rocks. If (unlike me) you don't seek out gins that make you feel like you're drinking a forest, then I encourage you to give this one a shot! I chose to further enhance the citrus tang of this drink with Fabrizia's delicious Limoncello. If you haven't yet tried a limoncello, it's a traditional Italian lemon liqueur made from soaking lemon peel in neutral spirit and then adding simple syrup. Most of the limoncello liqueurs I had tried to date were overly sugary to the point of being undrinkable, but I truly can't get enough of this one. I love that it's true to the lemon taste and aroma with a balanced sweetness and an almost creamy finish. It's clear that this limoncello is made with huge attention to detail and generous fruit content - I really can't recommend it enough. When I think of my travels to Italy, I immediately picture the colorful cliffs and blissful beaches of Cinque Terre. I wanted this drink to channel those sights and the timeless, carefree feel of the quaint coastal towns. I added color and lightened the cocktail with cold brewed hibiscus tea. Hibiscus adds a deep, fuchsia hue and is pleasantly tart for a floral ingredient. 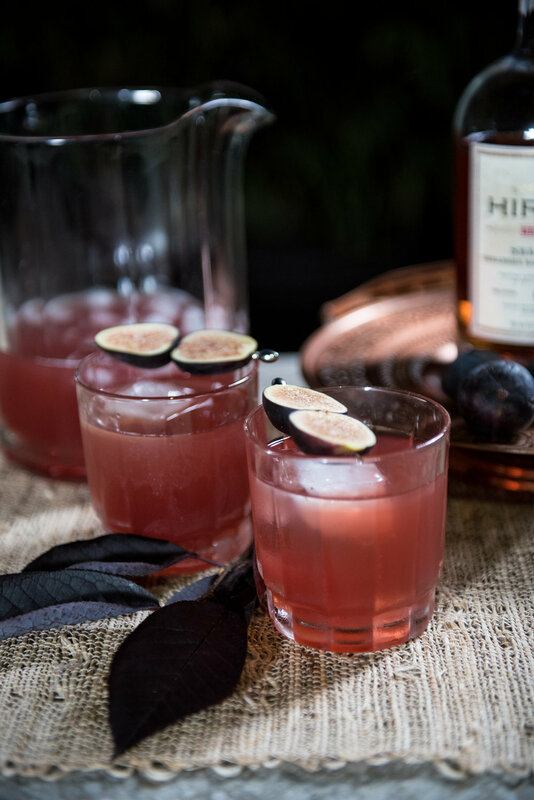 Using hibiscus allowed me to bypass using any additional citrus, making this a a fairly easy and convenient drink to make in bulk for spring entertaining. I garnished the cocktail with fresh mint to highlight the freshness of the Fernet and a lemon twist for an extra pop of color and uplifting citrus scent. The resulting cocktail is zesty, fresh and incredibly drinkable for all palettes! Shake all ingredients with ice to chill, then strain into a sturdy, wide-mouthed wine glass over ice. Garnish with a sprig of fresh mint and a lemon twist. Enjoy outdoors with a wood-fired pizza and a view of the Mediterranean Sea. *To make cold-brewed hibiscus tea, steep 2 tbsp of dried hibiscus flowers per 8 oz of water for about 45 minutes, shaking occasionally. Strain and store excess in the fridge. Thanks to Belen Aquino for the stunning cocktail photography and to Gather Vintage Tablescapes for the glasses. The blue lacquered tray is from CB2. If you're still under the impression that there is only one type of orange, you've been seriously missing out (or masterfully avoiding grocery shopping trips since childhood). Especially at this time of the year, produce aisles are overflowing with a variety of citrus - lemons, limes, grapefruit, oranges and many combinations thereof. This gives you the perfect excuse to slow down on the weekend and enjoy breakfast in bed with a fresh and exotic mimosa. I chose to feature Cara Cara oranges for their sweeter, less acidic, and more complex taste. While they're practically identical to ordinary navel oranges from the outside (I recommend keeping them inside a separate bag in the fridge so you don't mix them up), they've got a rosier hue on the inside and a flavor reminiscent of red fruit. They're also seedless and therefore easier to use as different forms of garnish. Is using fresh citrus in a mimosa worth the extra effort? Yes, yes, and again, yes. Not only does fresh-squeezed juice have more flavor, but the aromatic experience of working with fresh citrus will pleasantly invigorate your senses. You can also set aside a few slices to snack on with breakfast or to adorn glasses if you're making these mimosas for a gathering. If you're truly concerned about the time involved, make a jar of fresh-squeezed juice in advance and refrigerate overnight. I wanted to add an herbal twist to this mimosa for more complexity so I challenged myself to experiment with an herb that was new to me: marjoram. Hailing from the same family as oregano, marjoram is a tad sweeter, with flavors of citrus and pine. It's been said to help calm anxiety and boost immunity, making it a perfect ingredient to incorporate during cold season. I find that I get the most flavor from herbs by making them into a simple syrup and adding a fresh sprig as garnish to complement taste with scent. For the bubbly, I chose to feature La Marca Prosecco because I wanted something crisp and fresh to work with the orange and herb flavors. I appreciate that this Prosecco is such a great quality for the price point and easy to find at most stores. The resulting mimosa is lightly tart, blissfully scented and pleasantly effervescent for enjoyment at any time of day. Add fresh squeezed Cara Cara orange juice and marjoram syrup to a champagne flute and stir to combine. Top with chilled Prosecco and garnish with fresh orange and a spring of marjoram. Enjoy while appreciating a slow and relaxing weekend morning. * To make syrup, dissolve 1/2 cup sugar in 2 cups water in a small saucepan, then add bunch of fresh marjoram. Simmer for 5-10 minutes, or until your desired flavor has been achieved, then strain and allow to cool. Store excess in the fridge for up to 3 weeks. Thanks to Belen Aquino for the stunning cocktail photography and to Gather Vintage Tablescapes for the tray and vintage cups and saucers. Champagne flutes are from Crate&Barrel.